DC capacitors up to 150 Kv DC, energy up to 20 kilojoules, and inductance as low as 40 nH manufactured using biaxially oriented hazy propylene film as dielectric, aluminum foil as electrode and impregnated with Non-PCB as impregnant. These capacitors are designed for use in Energy Storage and discharge applications. • with dead casing, open terminal (2 bushings). • with live casing, open terminal (1 bushing). BIS 13666:1993 (Indian Std.) Energy Storage Capacitors. Capacitors in accordance with other standards / against specifications can be manufactured upon request. Max. Peak Current 25 kA. Max. Peak Current 50 kA. Max. Peak Current 200 kA. Max. Peak Current 500 kA. Repetition Rate E. Over 100 PPS. Category L 0 to 45° C ambient. Category H 0 to 50° C ambient. 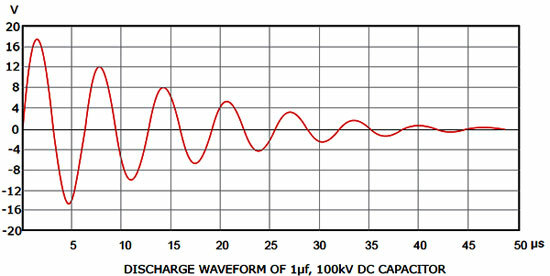 Category L 1 0 to 70° C ambient. Category H1 0 to 50° C ambient. The max. Permissible overload current shall be 1.1 times the rated peak discharge current at rated percentage voltage reversal and rated voltage. I (peak) = K x UR x (C/L) 0.5 and K is a constant depending on percentage voltage reversal. When installing the equipment, relevant IS recommendations shall be observed. Imported bi-axially oriented double hazy Polypropylene film and 99.9% pure aluminum foil are used as dielectric and electrode. Wrinkle free winding of the elements is carried in a Class 100 environment on a Semi- Automatic winding machine with edge and end folding of the aluminum foil. This is to eliminate over voltage stress at the edges of the buried area of the foil. Each wound element is tested for DC Overvoltage with stand and adequacy of margins between AI foils and pin holes. Numbers of elements are interconnected in series - parallel to achieve the desired capacitance and designed voltage rating of the Capacitor. The dry pack is wrapped with several layers of high quality insulating paper before inserting it into a pretreated / sheet metal container grade SS 409 L and the top lid is welded by semi- automatic Pulsed TIG welding machine. The capacitors are then processed in a PLC controlled autoclave for drying and under heat @ 85°C and vacuum of 0.001 torr for a given period. After confirming the quality of drying by precision online monitoring instruments, the capacitors are then impregnated under vacuum with highly purified and degassed Jarylec C-101. After completion of electrical tests, the capacitors are then loaded on a overhead conveyorised painting system. The capacitors are first subjected to sand blasting which ensure removal of welding burrs, minor scratches etc. making the surface perfect compatible for painting. Thermal spray is also done against specific orders. The capacitors are then painted in a painting booth with semi-automatic painting gun with two coats of epoxy primer followed by two coats of epoxy air drying paint. The paint layers are tested at random for adhesion to the surface of the capacitor. Capacitors may be mounted vertically or horizontally as required. Based on the state of art plant & machinery, quality of raw materials used, manufacturing under strict quality control and process using precision on line instruments, and elevated over voltage test results under extreme temperatures, capacitors are assured of minimum 20 years life. Note: Product improvement is a continuous process. For the latest information and special applications, please contact us ..